I wish the title of my post could be taken literally, because I’d love to meet Mr. Pepin… Unfortunately (or perhaps I should say malheureusement), I was just playing with one of his recipes: a broccoli puree from his book “Fast Food My Way” that might very well be one of the side dishes I make most often. I am not the only one who loves it, Phil asks me to make it whenever he is grilling a side of salmon or cooking fish filets. It is a perfect accompaniment for seafood, but I also like to pair it with roast chicken or pork. Versatile, non? Bring 3 cups water to a boil in a medium saucepan. Add the broccoli florets and the garlic clove. Bring back to a boil, reduce heat, and cook until tender (about 10 minutes). Drain and reserve some of the cooking liquid. Melt the butter in a small skillet and cook it over low heat until it turns golden brown. Do not let it burn. Put the broccoli and garlic in the bowl of a food processor, add salt, pepper, and nutmeg. Process until almost smooth, open the processor, drizzle the browned butter and add the spinach leaves on top. Process again until fully smooth, adding a bit of the reserved cooking liquid until the puree achieves a consistency you like. Taste and adjust seasoning. Serve right away, or refrigerate. It reheats well in the microwave. I do hope you’ll try my version of Pepin’s recipe, it is amazing how just a little spinach took this puree to a higher level. A subtle change in texture, a real bump in flavor. I normally don’t preach on nutritional content of food, but the humble spinach always makes me feel great. Old Popeye cartoons speaking (and dating me), I suppose. I enjoy broccoli but have never tried a puree. And the tilapia looks so good. My usual way of cooking it ends up with a fairly anemic product but your golden and grill marked filets are beautiful. Thanks! That grill pan works very well for fish filets, it’s now our default method, as I am not very good with the outside grill and delicate filets. I do pork, beef, lamb, chicken, but when it comes to seafood I prefer to cook it inside. The smoked paprika gives that fish such beautiful color! ooh, this is such a great idea! I often wilt spinach (which is a great way to pack in volume 😉 but I’ve not combined it in this way with other veggies and puréed… I’m glad you share this because protein over a bed of vegetables is one of my favorite ways of eating and it’s always fun to have new and fresh presentation ideas. I think the boys would also be inclined to eat more expansively on the veggie side this way too 🙂 (especially our eldest with braces it really is an issue) – love it Sally, thanks! I had the good fortune of cooking with Jacques for a week during a program at BU, and I must say that it was such a thrill. Not only was he warm and engaging, but a terrific teacher as well. 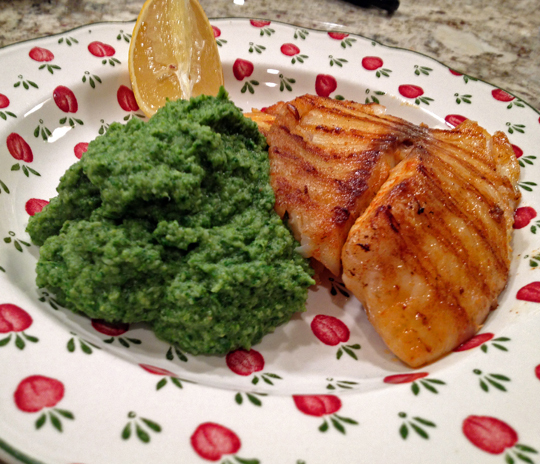 Love the idea of fortifying the dish with the spinach, and bet the browned butter really knocks it out of the park! Ok, I am going to need my smelling salts here…. You say you cooked with Jacques for a week, without preparing myself for it, just like that? Oh, the stars in heaven! you lucky lucky lucky man! Pureed vegetables are all about the presentation. I tired the carrot souffle you featured a few months back which was new approach to a simple staple. It got me to thinking. After your side dish supper use any of these leftovers purees (broccoli, spinach, kale etc). in mini souffles, These are all a perfect addition for a Sunday brunch. A longtime favorite of ours is to puree cooked cauliflower (drain cooked cauliflower, and in the same pan use your hand blender to puree) add a good quality olive oil, salt and pepper and a splash of heavy cream and blend as a substitute for mashed potatoes. This provides a healthy base for a piece of grilled salmon with a side of bright green peas.and you have dinner. Vegetables are so underrated. anyway, I agree with you, vegetables can be amazing, particularly if we open our horizons and use them in “unexpected” ways. NOw, if only Phil could warm up to beets…..
Ooooh! I’d never think to make other veggies in a mashed-potato-style, but this sounds really good! What an interesting idea! I am mad, mad, mad at myself! I have steamed or stirfried broccoli at least 2-3 times a week for decades and never turned it into a puree for a change! As I love vegetable purees I have no idea how that has come to pass so ‘thank you’ for a wakeup call 🙂 ! Normally I never boil vegetables but to get a little of the leftover water, I’ll try it Monsieur Pepin’s way 🙂 !! If Pepin talks, I listen… I have a recipe published a couple of years ago, a simple salad with boiled eggs that he cuts in half and quickly sautee in a pan. Simple, unusual, and so full of flavor! I can’t tell whether the.boy would be okay with eating this or whether the green hue would get to him. But I know I would surely love it! If he and I were single and he was a bit (a lot) younger, I’d marry him. I think he’s the cutest man AND he can cook! I wonder if he cleans up after himself? I’ve never tried the broccoli and spinach puree but now I want to. I’ve used broccoli, onions, garlic and butter to make a pasta sauce – that’s the closest I’ve come. I know how you feel… that accent is a killer too, isn’t it? See? This is why I love blogging. I’ve never pureed broccoli, and I have no idea why not. 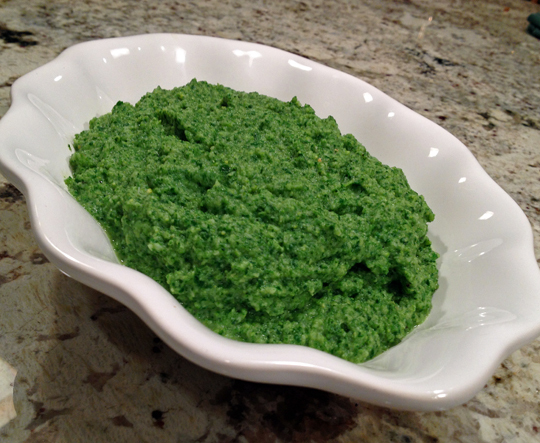 I’ve pureed cauliflower, and of course spinach, like in saag paneer (Indian-spiced spinach). This looks absolutely wonderful, and I bet the texture is wonderful, too.